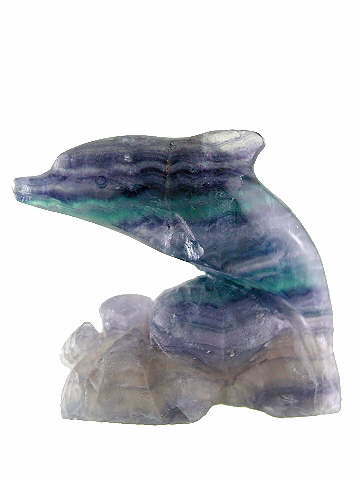 Exquisite Fluorite carving of a pair of dolphins; mother and baby (or cow and her calf). The calf is on the other side of the carving out of sight in the photo! Often refered to as 'the most colourful mineral in the world', Fluorite can be found in virtually every colour of the rainbow. In the healing world it is one of the most versatille crystals around and on a psychic level it is known as one of the most protective stones. Dolphins represent family and community, wisdom and compassion, making this a super combination.